LTO-8 is now readily available with a capacity of 12TB uncompressed and 30TB compressed however, to increase the tape capacity the drive heads and tape technology has changed. The LTO consortium rule of backwards compatibility, reading back from two generations and writing back to one generation has been broken. Unfortunately LTO-8 can only read and write to LTO-7 tape. We're told future generations of LTO Tape will revert back to the old rule of providing backward compatibility for two generations and in the long run will provide a better storage and archive medium. For the short term though, what do you do with the data you have on LTO-6 tapes? Tapes you may have been planning to move across to LTO-8. Moving data from LTO-6 to LTO-8 will definitely be more beneficial, not to mention with a much larger capacity it will be a space saver! To help ease and take the pain out of migration to LTO-8 tape Polar Graphics are pleased to announce the launch of the TRB3-HL-MIG from MagStor. A neat desktop unit which provides proper LTO drive orientation (horizontal) with 1x LTO-6 drive and 1x LTO-8 drive. Migration has NEVER been easier or more compact. This unit will allow customers with LTO-4/5/6 backups and archives to easily migrate to LTO-7/8. The process can be made even simpler by using a third party software such as myLTO and or PreRoll Post, both from Imagine Products and also available through Polar. Once migration is complete the 1x LTO-6 drive can be replaced with an LTO-8 drive, providing you with a dual drive LTO-8 unit. 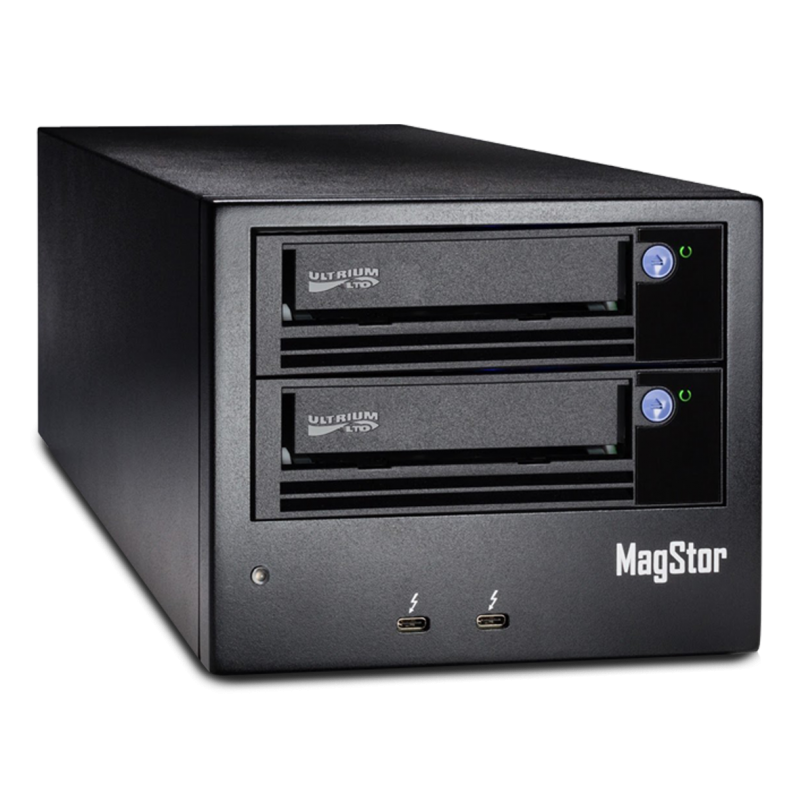 MagStor is a daughter company to Magnext, which has 12 years industry experience selling complete systems, repairing, and refurbishing tape storage products. Spotting a gap in the market MagStor was created to promote the MagStor product line and data storage products tailored specifically to the media and entertainment clientele. The first Thunderbolt 3TM certified tape drive. With Thunderbolt™ 3 / USB-C port connectivity the units can be easily connected to your desktop MAC or PC. Taking advantage of LTFS (Linear Tape File System), users can easily drag and drop files to and from an LTO. Having been distributors / representatives for the broadcast, post and video industries for over 25yrs Polar Graphics are experts in their field. Known as the Polar Bears they work closely with their suppliers, partners and resellers to ensure they provide the very best products and services to an ever changing and growing industry, placing them at the forefront of their field. Other brands represented or distributed by Polar Graphics and associate companies include; Apantac, Bluefish444, Cinedeck, FocalPoint Server, Imagine Products, Mediaproxy, Stardom, StorageDNA and Studio Network Solutions (SNS). Posted in Company News, Latest News, MagStor, MagStor: Library, Press Release and tagged Hot News, LTO, LTO 6, LTO 7, LTO 8, LTO Drive, LTO LTFS, LTO Migration, LTO Tape, MagStor, Media Storage, myLTO, Polar Hot News, PreRoll Post, Storage, storage solutions, Tape Migration, Thunderbolt, Thunderbolt 3.